by Ludinia Carter on November 9, 2018 . LinkedIn is a great tool for reaching and interacting with businesses from around the globe. With over half a billion professionals on LinkedIn, it’s by no surprise LinkedIn is the top-rated social network for lead generation. But the there’s a catch – it’s only as effective as your content strategy. If you want to leverage LinkedIn’s real value, you need to have a plan to increase your LinkedIn engagement. But while you may have heard about how much potential LinkedIn has for business, do you still struggle with actually generating any traction with your profile? Or better yet, how do you maximize you or your company’s engagement on LinkedIn? If you’re looking to improve your LinkedIn engagement rates, here’s how you can improve your content strategy. What you should post about? LinkedIn is unique in its user habits, being a professional social network. And if you want to get your posts to be seen by more people, you need to know when they are online. The best resource we have found for identifying LinkedIn hotspots throughout the day is from Hubspot. They found a couple of key behaviors. 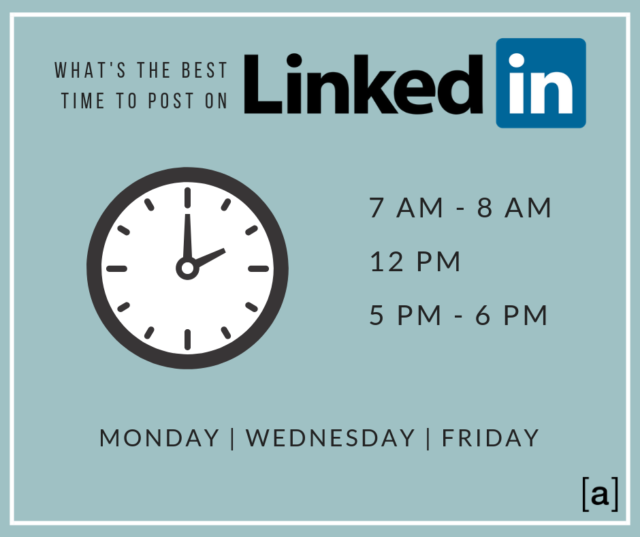 The results showed that Tuesday through Thursday from 7-8 a.m., 12p.m., and 5-6 p.m are when LinkedIn users are most active. They found that most LinkedIn users are business men and women, who are likely to get on their social platforms before and after work as well as during a lunch break. LinkedIn is a much more formal platform than platforms like Facebook and Twitter. It’s really more about quality than quantity. Thus, the best number of times to post is a minimum of 2 times per week and a maximum of 5 times per week, or you can think of it as 20 posts per month. Knowing what to posts simply comes with knowing your audience. Think about it this way. You know that you are mainly talking to business owners on a professional platform. This means you want to have posts with high value to your audience. 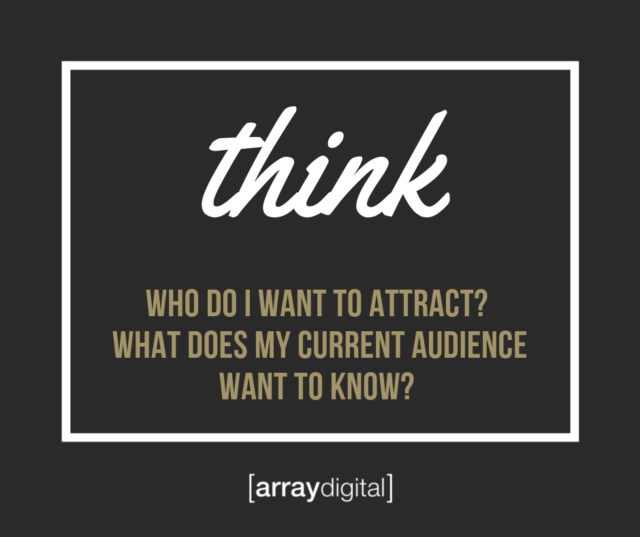 Think: who do I want to attract? And what does my current audience want to know? According to research found by Chief Marketer, 59% of B2B marketers find it challenging to engage their targeted audience. This is because they often get stuck in pushing out generic “look at me and my opinions” content. In knowing what our audience would like to know, we can post content answering their questions. Our audience will be more likely to interact with our content because it is about topics they are interested in. A core element of a good posting strategy is to focus on posting interactive content like questions, polls, or posts that test your audience’s knowledge. Having a built-in call to action that seeks out other people’s expertise will boost the chances of your audience engaging with your posts. 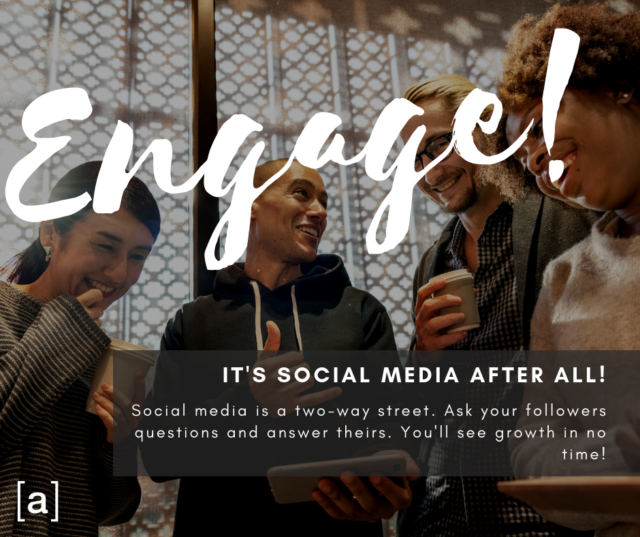 Other helpful ideas on encouraging engagement in posting include keeping your captions concise, prompting an action from your audience, hinting at how your content will impact them, telling a story, and quickly reacting to timely news. Finally, social media is a two way street. You need to be active in engaging other people you know if you want people to engage with you! This doesn’t have to take up too much time. Just take 5 minutes each morning to scroll through a couple of posts. Congratulate Jim on his company’s achievement. Give a digital high-five to Alexa for her new job promotion. Just be active contributing to other people’s pages, and you’ll see an increase in your own page’s activity.